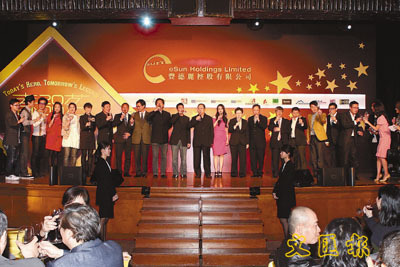 eSun Holdings Limited held its spring dinner at Wan Chai’s Grand Hyatt Hong Kong three nights ago, there were a total of 34 tables, it was crowded as artistes, directors under Peter Lam and guests attended. There were two host tables, Peter Lam and his daughter Emily Lam sat at separate host tables. The first to sat by the sides of Peter were Andy Lau and Shu Qi, in the same table were Tsui Siu-Ming with his wife, Jim chim, Johnnie To, Richie Ren and Simon Yam. In the other host table were Emily, Leon Lai, Denise Ho, Miriam Yeung, Michael Hui, Liu Jia Chang with his wife, Andy Hui, Bosco Wong, Andrew Lau, Virginia Lok and Lin Xiao Ming. Everyone dine and drank happily. At the dinner, after the opening speech by Emily to talk about the earnings and future plans of the company, it was followed by boss Peter Lam leading his son Lester Lam, Leon Lai, Andy Lau, Shu Qi, Miriam Yeung, Andy Hui, Denise Ho and other shareholders up the stage for toasting. Former lovers Leon and Shu Qi were standing at either side of the stage, Andy took the initiative to toast with Leon. Leon then walk sideways the stage to toast with everybody including Shu Qi.